This year’s upcoming Commercial Vehicle Show will see The Tyre Equipment Company (TEC) return to the NEC showcasing a selection of commercial tyre changing tools and equipment from Ken-Tool, as well as other products from the TEC range. Ken-Tool, headquartered in Ohio, is a leading manufacturer of tyre service tools worldwide. It has been providing the tyre industry and automotive aftermarket with quality products for over 90 years. 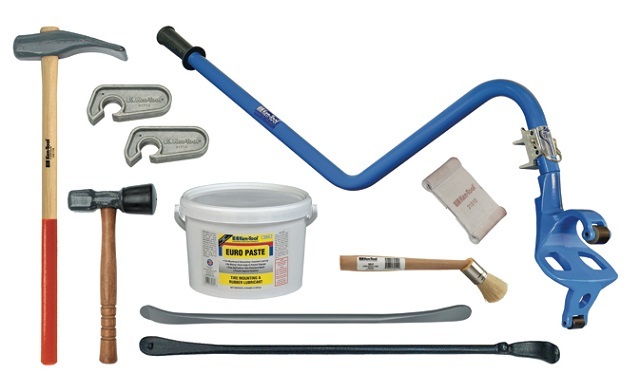 The range, which has recently been added to TEC’s offering, includes products such as the Deluxe Blue Cobra Tubeless Truck Tyre Service Set, which includes the Blue Cobra demount tool, a tubeless tyre iron, a double-end tyre spoon, a bead breaking wedge (with safety handle), a heavy-duty tyre hammer with a replaceable rubber head, a bucket of euro paste lube, a euro-style lube applicator brush, an aluminium C-Lok bead holder and a leather rim protector. There will be a chance to win Ken-Tool’s Deluxe Blue Cobra Tubeless Truck Tyre Service Set by taking part in a competition on the TEC stand. This set contains all the tools needed to change most 22.5” and 24.5” tubeless truck tyres easily. It is currently available from the TEC website for £385.00 excl VAT. The union between the two companies further adds to TEC’s extensive range of tyre service parts and equipment, which includes a wide selection of products from leading equipment manufacturers such as PCL and Schrader. As well as Ken-Tool, visitors can expect to see a wide array of tools from other leading manufacturers on the stand and the TEC team will be on hand to provide technical advice and assistance. For further information, contact the team via email sales@tyre-equipment.co.uk or telephone 01905 821697 / 01476 513801. Alternatively, you can visit the TEC website at www.tyre-equipment.co.uk. The company offers free delivery throughout the UK mainland with no minimum order value. This year, TEC will be exhibiting in the Workshop section of the show which is located in Hall 4. The TEC team can be found on stand 4E121.